And of course we got a little lovin' time with Bella's beautiful beau, Gus, and his sweetheart sister, Molly. I'll share some of those photos next week. In the meantime, these may be the sweetest, or most pathetic pictures, I've ever taken. We probably won't be taking Bella to these events in the future - it's just not fun for her anymore. It's too bad, she used to like them. And yes, that is Bella going to Jan for comfort from the scary. Our relationships with this dog are complicated. PS - Anyone else notice she's standing on his foot? I missed the shot where she was actually on his lap. Everybody say "Awww..."
Poor Bella. Sorry it didn't go as well as you hoped. But it's very sweet that Jan is a comfort to her. Poor Bella! It's too bad she's not enjoying events like this anymore. I think the pictures of her and Jan are sweet. Thanks for the link to the salmon oil. It worked! It sounds like pretty good oil, lots of good reviews. Bella's reaction to a giant crack dog in her face really wasn't that bad! Maggie tends to come off a little intense in meeting new dogs, I don't blame Bella at all. We probably should have just walked them in the same general direction with more space between them, less pressure than a face to face. Bella did settle down pretty quickly though, she was good considering all of the space invaders! Love the pictures of Bella with Jan, he is so patient with her and it's easy to see how much she does trust him. It was great to see how happy she was to see Gus, he is such a big handsome goofball! So glad we finally met! "We probably won't be taking Bella to these events in the future - it's just not fun for her anymore. It's too bad, she used to like them." Kudos to you for recognizing that your dog's wants have changed and looking out for what's best for her. I see way too many people with unhappy dogs who are either unaware or choose to ignore it. Oh, poor Bella. It's no fun to be afraid. It's okay though, there is still lots of fun to be had!! Cali doesn't like those big events either!! sometimes we just change our minds and I am glad you are intune with your dog. It was fun when I was younger, but hey, I'll rather now do something different with you. 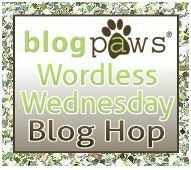 I too am not too keen on big crowds...Wagging wordless Wednesday! Poor girl, but it is sweet how she wants comfort. Isn't Gus such a doofus? A beautiful doofus but a doofus none-the-less. And he's so good for/with Bella. We've been blessed with that relationship and his folks are now among our most treasured friends. It was marvelous to meet you and your husband. And thank you for being so kind about Bella. Sorry Bella didn't have any fun at the place you peoples took her too, but nice that, at least in that instance, she sought comfort from The One Named Jan. I with you Bella. Somethings like that just make me want to go home. Well Bella, we're not sociable either. You can come and visit us on the blog; that will feel safe! It's so nice to see her cuddled up with Jan. Even if the day wasn't a big success, there are small moments to treasure.